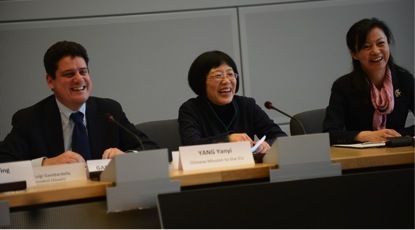 Brussels, 5 February 2015 –On Tuesday, February 3rd, the European Commission hosted three high-level meetings involving senior representatives of leading Chinese and European financial Institutions and ICT companies as well as a high-level delegation of the Chinese Mission to the EU, led by Chinese Ambassador Yang Yanyi. 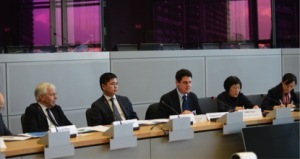 These meetings were arranged at the initiative of a new business association, ChinaEU, based in Brussels and Beijing. Jyrki Katainen, Commission Vice-President for Jobs, Growth, Investment and Competitiveness, Andrus Ansip, Vice-President for Digital Single Market, and Federica Mogherini, High Representative for Foreign Affairs and Security Policy and Commission Vice-President, met with a select group of Chinese and European ICT industry and banking executives. This unusual gathering provided a unique occasion to strengthen bilateral economic and investment relations in ICT, ​with a view to continuing the dialogue at the 17thChina-EU Summit, to be held this coming June in Brussels. 1) Joint development and promotion of mobile technologies for 5G.China and the EU should leverage their technological and market strengths collaboratively, and thus establish a major strategic presence in the future 5G mobile markets globally. 2) Encouragement of Chinese investments in advanced European digital infrastructure and services, in tandem with the new EU Investment Plan of EUR 315bn targeting 21st Century strategic infrastructures. This could be done through the creation of dedicated JVs and public-private partnerships involving both European and Chinese ICT players and financial institutions. 3) Enhanced cooperation on Smart Cities, Smart Energy, and Internet of Things, accelerating and expanding ambitious projects already initiated by the EU-China Policy Dialogue Support Facility. 5) Establishment of major ​investment funding and incentives focused on incubating hi-tech startups and collaborative innovation in both Europe and China. This was the first time a group of Chinese company representatives met with their European counterparts at the headquarters of the European Commission. That sends an important political signal that both sides are committed to bolstering their existing ICT partnerships going forward. The participants expressed their intention to identify and elaborate specific priority projects at a Technical Workshop, which could be organized together with the European Commission, the Committee of the Regions and the Chinese Government. The proposals would be subsequently presented to the European Investment Bank, for consideration by European and Chinese political leaders during the Summit. 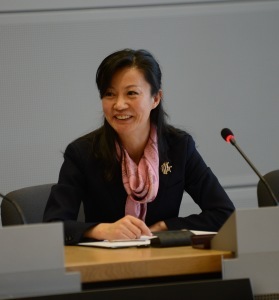 Laura Lei Zhang, General Manager ofChina Mobile International UK, introduced: “China Mobile Group serves over 790 million subscribers, as of June 2014. China Mobile Group embraced the migration of the core driver of telecommunications revenue from mobile communications services to innovative full-services and from communications services to digital services. 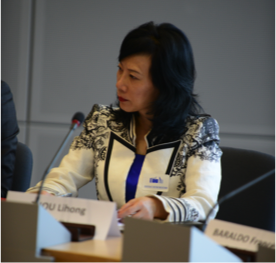 The discussions focused on the collaboration opportunities that can be generated through Chinese participation in the ambitious EU Investment Plan to mobilize some EUR 315bn of public and private investments in new strategic infrastructures. Together with the realization of a European Digital Single Market, the Investment Plan is one of the flagship initiatives of the new Juncker Commission. China, for its part, is embracing a 21st Century economic model that gives priority to new engines of growth, first and foremost, ICT. There was a consensus that these extraordinary meetings represent the first step of a sustained initiative pointing to win-win outcomes in EU-China bilateral relations. A guiding aim is to focus on the common interests of Chinese and European businesses, rather than on past differences. The upcoming China-EU Summit, which coincides with the 40th anniversary of official diplomatic relations, can be a showcase for unprecedented industrial cooperation across new digital sectors.